Witch hazel has nothing to do with witches or their strange brews, but it sure is magical. I am sure you would have heard of it. If not, you need to read this article. Because you are missing out on a very potent and multipurpose skin ingredient. It heals wounds, soothes your skin, prevents itches and rashes, and also helps fight acne. If you are looking for a natural solution to deal with acne, witch hazel is your answer. To understand how you can make the best out of this ingredient, keep reading. How Does Witch Hazel Help Heal Acne? 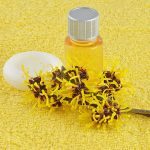 Witch Hazel: Are There Any Side Effects? Studies have found that the anti-inflammatory properties of witch hazel can help soothe skin inflammation. It has skin soothing properties and is often used as a treatment for acne (1). 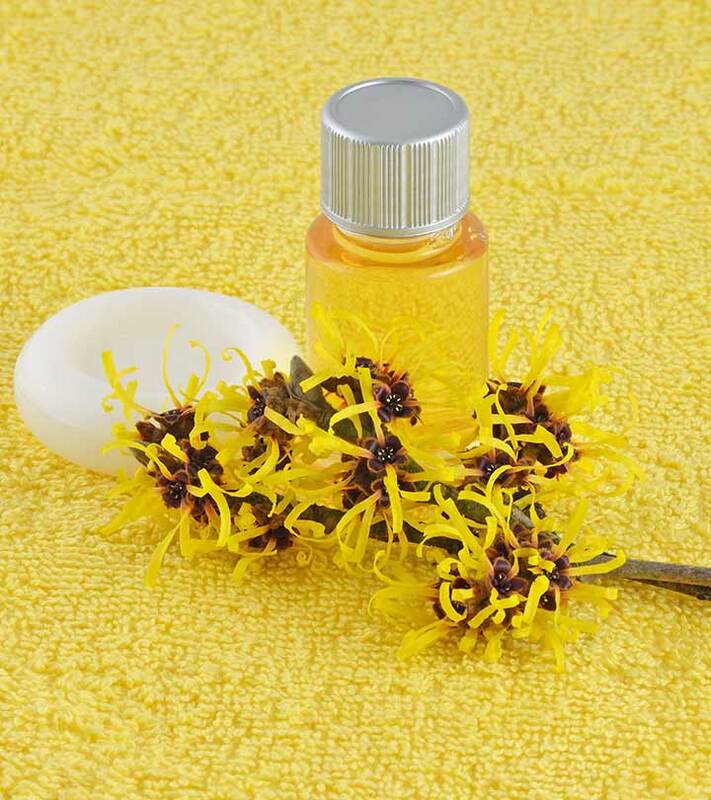 Witch hazel has astringent properties as it contains tannins. It helps shrink your skin pores. This reduces excess oil production. It also prevents dirt, dead skin cells, and acne-causing bacteria from entering and clogging your pores (1). A study found that witch hazel ointment could hydrate your skin and keep it moisturized (2). Keeping your skin moisturized is crucial for treating acne. Dryness often damages your skin barrier, causing water loss and inflammation(1). It fights harmful free radicals that damage your skin (3). It prevents skin irritation and skin redness caused by excessive UV exposure (4). It has antimicrobial properties and can prevent bacterial and fungal growth on your skin (5). 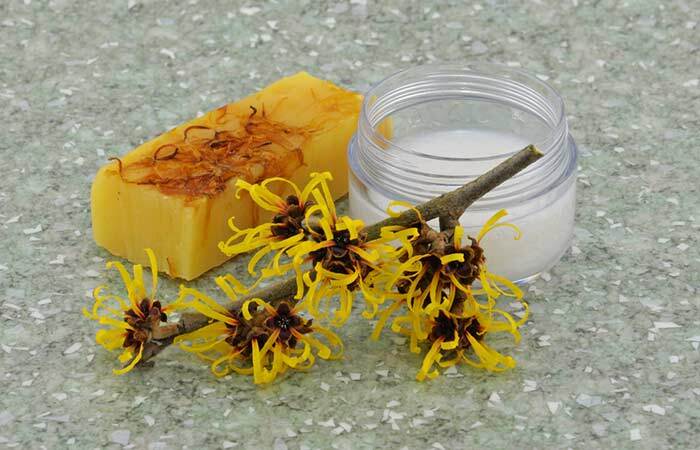 Witch hazel is extremely mild, and you can use it every day on your face. Here are a few simple recipes you can try. Wash your face with a mild cleanser and pat it dry. Pour a few drops of witch hazel on the cotton pad. Apply the pad to your face and the affected area. Let it dry. Apply your face serum or moisturizer. Take a bowl and mix the aloe vera gel with witch hazel. Spread it on your face and gently massage. Let it dry. Do not wash. Mix the honey or egg white with witch hazel in a bowl. Let it stay for at least 20 minutes (if you are using egg white, wait until it dries). Take the jar and put the herbs in it. If you want the potion to be mild, use just 2-3 teaspoons of the herbs. For a stronger potion, fill half of the jar with the herbs. Pour witch hazel over it (enough to cover the herbs). Put the lid and store in a cool, dry place. Store it for two weeks and shake the jar every day. You may add more witch hazel if you see the herbs have completely soaked in the liquid. Strain the liquid after two weeks and transfer to a bottle. Dip a cotton ball in this and apply it all over your face or the affected area. You can use witch hazel as per these recipes or consult your doctor and use it as directed by them. Although there aren’t any reported side effects of witch hazel, it can cause some serious reactions. Also, avoid applying witch hazel on broken skin as it can cause irritate your skin further. 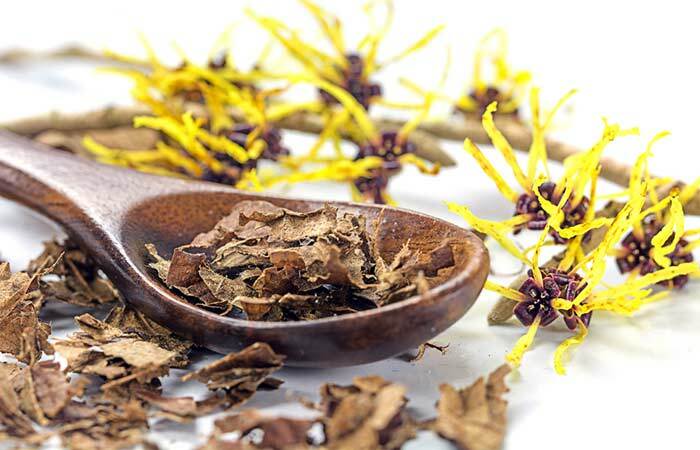 Always consult a doctor before using witch hazel as a treatment option for acne or any other skin issues. Don’t know where to get witch hazel? Check out these online options. Here’s a list of witch hazel products you can try. 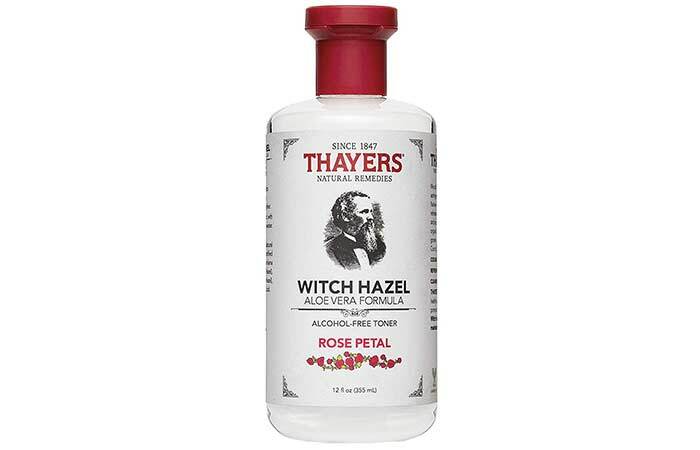 This is an alcohol-free toner that contains rose petal extracts along with witch hazel and aloe vera. 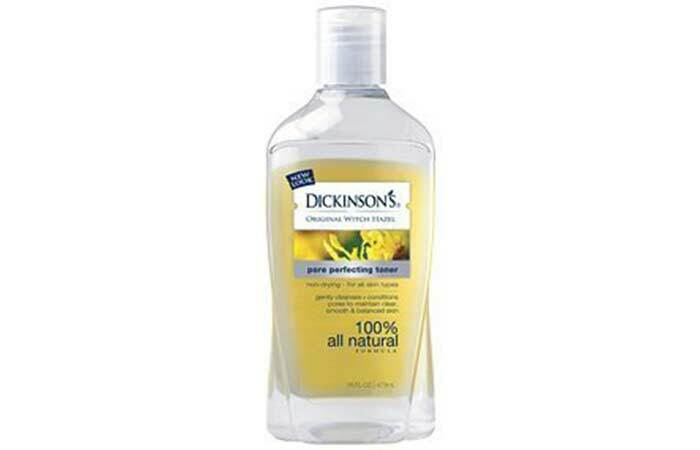 This toner can help hydrate your skin and calm down skin irritation. Although it is suitable for all skin types, if you have extremely oily skin, you are going to love this one. 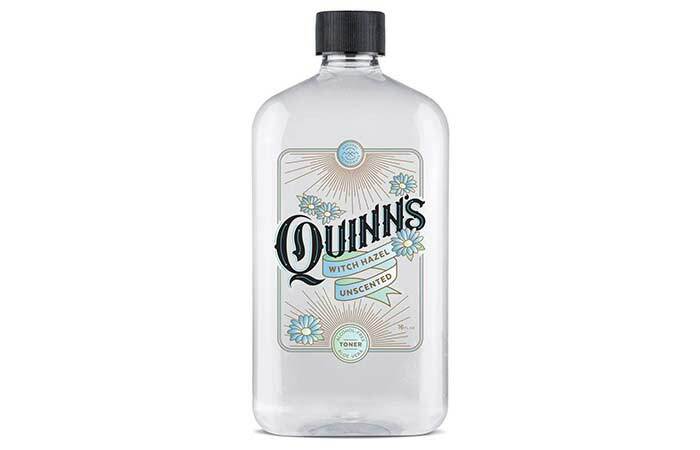 It contains naturally distilled witch hazel extracts. This product is alcohol-free and fragrance-free. It is hypoallergenic and suitable for all skin types (even sensitive skin). It is non-drying and claims to keep your skin moisturized. 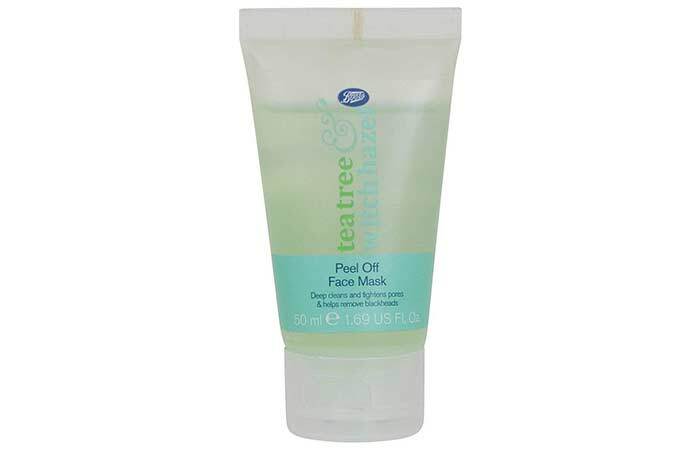 This peel off mask is dermatologically tested and has antibacterial properties. It deeply cleanses your skin, tightens your pores, and prevents acne and further breakouts. This skin astringent doesn’t contain any artificial dyes and fragrances. It can relieve skin irritation, prevent inflammation, insect bites, cuts, and burns. It is cruelty-free. The American Indians first used this winter shrub with yellow (sometimes red and orange) spider-like flowers with spicy fragrance. They used it to fix almost everything – from skin infections to bruises and other medical issues. It is a go-to solution for all your skin woes, especially acne. However, it is only a short-term fix. Your acne may be due to many underlying causes. Unless you address those causes, nothing can ensure long-term relief. Hence, it is better to consult a skin care specialist and get your acne condition reviewed. Did you ever use witch hazel? How was your experience? Do you know any other way of using it? If yes, share it with us in the comments section below. “Moisturizers for Acne”, The Journal of Clinical and Aesthetic Dermatology, US National Library of Medicine. “Hamamelis in children with skin disorders..”, European Journal of Pediatrics, US National Library of Medicine. “Highly galloylated tannin fractions..”, Chemical Research in Toxicology, US National Library of Medicine. “Anti-inflammatory efficacy of topical..”, Skin Pharmacology and Applied Skin Physiology, US National Library of Medicine. “Antiseptic effect of a topical dermatological..”, Research in Complementary and Natural Classical Medicine, US National Library of Medicine. 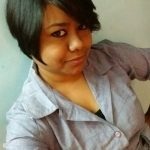 Cystic Acne – What Is It And How To Heal It?